Our cafe and licensed bed and breakfast are located in the centre of historic Crail, a few minutes walk from the harbour. Our bed and breakfast accommodation is cosy and provides a perfect base by the sea to explore the beautiful fishing villages in the East Neuk. Our wee cafe wakes up the day with breakfast, followed up by home baking, speciality coffees and great beers or wine. Drop in for a late breakfast, a light lunch or drink, sit in our back garden or watch Crail go by from the coffee shop. Our accommodation offers 3 bedrooms, all on the upper floor of the Honeypot. Seaview is a twin bedded room with sea views and a private bathroom. Elie is a cosy double bedroom with an en-suite bathroom and our Crail room sleeps up to 3 adults, also with en-suite facilities. Free Wifi is available for our guests. Private parking. 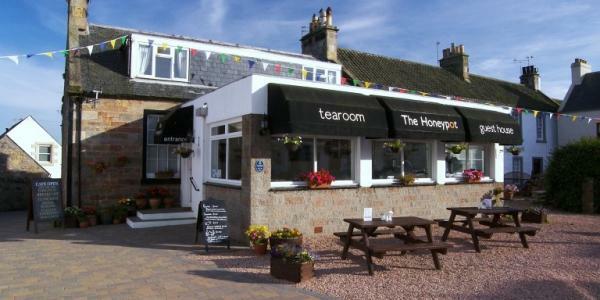 The Honeypot Guesthouse is listed as number 1 of 9 bed and breakfasts in Crail, 2010-2018! Click on the link to the left to read our reviews.